1. What does the FOMC think it's doing? 2. Given what it thinks it's doing, is the FOMC consistent? 3. What should the FOMC be doing, given its stated goals? What does the FOMC think it's doing? The easy part here is what most of us know by heart. The FOMC has a statement, most recently amended in January, which says that the Fed is targeting headline PCE inflation at 2%, that it cares in the same way about deviations from that target on the up side as on the down side and, consistent with its Congressional dual mandate, the FOMC is concerned about labor market performance. There is a hint in the statement that this concern might be reflected in greater Committee unhappiness the larger is the deviation of the unemployment rate from the natural rate of unemployment. But the FOMC's statement of longer-run goals, by design, tells us nothing about how the FOMC intends to achieve its goals. To figure that out, we need to watch what the FOMC does, and what the Committee members say. FOMC policy currently has two dimensions: (i) a target range for the fed funds rate; (ii) balance sheet policy. But, balance sheet policy is effectively on autopilot now. Last year, the FOMC decided to phase out its reinvestment policy, and thus allow a very gradual reduction in the size of the currently-very-large Fed balance sheet. There could be changes in balance sheet policy in the future, but no one expects that, as far as I know. So, FOMC actions currently consist of decisions about the target fed funds rate range, aimed at controlling inflation and unemployment (roughly). ... the level of the federal funds rate that is neither expansionary nor contractionary when the economy is operating near its potential. I've also heard the NNRI described as the level of the policy rate when the central bank is achieving its goals. So, it seems safe to say that Nirvana is achieved for the FOMC when headline PCE inflation is 2%, the unemployment rate is equal to the natural rate, and the nominal fed funds rate is equal to the neutral rate. But Yellen has left the NNRI ill-defined - probably deliberately, in typical central bank fashion - by not telling us what an "expansionary" or "contractionary" nominal interest rate might be. Almost all participants who commented agreed that a Phillips curve-type of inflation framework remained useful as one of their tools for understanding inflation dynamics and informing their decisions on monetary policy. While the minutes for the January meeting suggest that the Phillips curve is "one of the tools for understanding inflation dynamics," there is no indication that FOMC participants have any other such tools. Indeed, in Jay Powell's first speech as FOMC chair, the section on inflation is exclusively a defense by Powell of Phillips curve reliability. To cut to the chase, here's how the average FOMC participant thinks about monetary policy and inflation. Given the Phllips curve framework, the primary avenues through which monetary policy affects inflation, according to the Committee, are the output gap and inflation expectations, and we can measure the output gap using the natural rate of unemployment. If inflation is above (below) 2%, then the Committee should raise (lower) its fed funds rate target, which will lower (raise) spending, raise (lower) unemployment, and reduce (raise) inflation, due to the output gap effect in the Phillips curve. According to the Committee, as long as the Committee is doing its job in this respect, inflation expectations remain "anchored" - that is, expected inflation does not deviate from 2%. Occasionally, however, anchoring expectations may require some reassuring words from FOMC participants. While uncertainty around the long run level of these indicators is substantial, many of them suggest a labor market that is in the neighborhood of maximum employment. A few other measures continue to suggest some remaining slack. Most participants described labor market conditions as strong, noting that payroll gains had remained well above the pace regarded as consistent with absorbing new labor force entrants over time, the unemployment rate had stayed low, job openings had been high, or that initial claims for unemployment insurance benefits had been low. 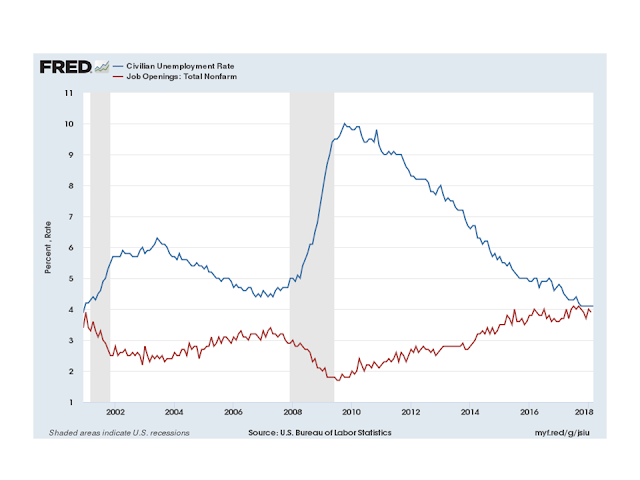 Many participants observed that the labor force participation rate had been higher recently than they had expected, helping to keep the unemployment rate flat over the past few months despite strong payroll gains. The firmness in the overall participation rate--relative to its demographically driven downward trend--and the rising participation rate of prime-age adults were regarded as signs of continued strengthening in labor market conditions. So, it has become increasingly difficult to say that the FOMC has not achieved its labor market performance goal, though some people on the Committee still have a hard time admitting it. Note, in particular, that in their March projections, the median FOMC participant seemed to think the long-run unemployment rate should be about 4.5%, which we can take to be an FOMC estimate of the natural rate of unemployment. The March unemployment rate, 4.1%, is well below that. So I think it's fair to say that the Fed has achieved its labor market goal - it's hard to see why Congress couldn't be convinced to be happy about 4.1% unemployment. So, the Committee thinks that the current fed funds rate range is not consistent with achieving its goals. In terms of its Phillips curve framework, FOMC participants must be thinking that its current "accommodative" policy rate range will produce lower unemployment and higher inflation in the future, and it needs to be less accommodative. How much less accommodative? Well, the March FOMC projections tell us the median FOMC participant thinks the NNRI is about 2.9%, so we have some ways to go, apparently. This year, John Williams says there could be three or four rate hikes, so I would bank on that - his opinions will carry a lot of weight, particularly after he assumes the NY Fed President's job in June. In general, I think the answer is yes. But, consistency is achieved, often as not, through vagueness and slippery changes in the terms of reference. Natural this and neutral that are words that carry authority. They have the ring of science and precision, but are anything but. If it can't be precisely defined and measured, it's wide open for abuse in policy discussion. For example, a policymaker looking for slack can find it somewhere - if not in U3, it's in U6, or in the participation rate, or in the participation rate of prime-aged workers, or in epop - whatever. What's a neutral nominal interest rate? Apparently we're there when the FOMC says we are. What should the FOMC be doing? ...the level that would be ground out by the Walrasian system of general equilib­rium equations, provided there is imbedded in them the actual struc­tural characteristics of the labor and commodity markets, including market imperfections, stochastic variability in demands and supplies, the cost of gathering information about job vacancies and labor avail­abilities, the costs of mobility, and so on. We can excuse Friedman for calling the model he would use to determine the natural rate a "Walrasian system," as of course he hadn't seen a Mortensen-Pissarides search model in 1968. Otherwise, he understands that such a model would have to have frictions of some sort, and that labor market tightness would have something to do with firms posting vacancies in order to attract unemployed workers. Friedman makes it clear that the natural rate fluctuates, and that it should not enter into policy decisions. So, if anyone thinks that Friedman's ideas justify how the natural rate is used in current policy discussions, they are wrong. As an empirical matter, low interest rates are a sign that monetary policy has been tight-in the sense that the quantity of money has grown slowly; high interest rates are a sign that monetary policy has been easy-in the sense that the quantity of money has grown rapidly. The broadest facts of experience run in precisely the opposite direction from that which the financial community and academic economists have all gener­ally taken for granted. So, there you have it. Friedman was a neo-Fisherite. He understood that "the broadest facts of experience run in precisely the opposite direction from that which the financial community and academic economists have all generally taken for granted." Apparently not much has changed. The financial community and academic economists - not to mention central bankers - all generally take for granted that raising the short-term nominal interest rate lowers inflation. But it ain't so. In Friedman's article, he lays out a theory of the Phillips curve, based on departures of actual inflation from what is expected. Money growth increases, inflation goes up, people work harder because they think their real wages are higher, and firms produce more output because they observe that the real wages they are paying have gone down. In Friedman's telling, expectations appear to be adaptive, but Lucas later formalized the idea and introduced rational expectations to macroeconomists in the process. The Phillips curve of course appears later in the New Keynesian (NK) literature. In a typical NK model, a Phillips curve arises due to a different friction - sticky prices. However, the mechanism at work is not so different from what Friedman and Lucas had in mind. A firm subject to Calvo pricing sets its price in anticipation of what might happen before it receives another opportunity to change its price, so price increases will reflect anticipated inflation. 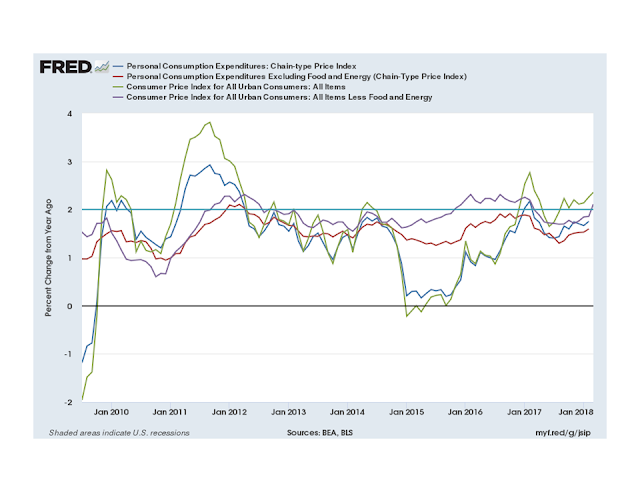 But, if inflation is unexpectedly high, then the relative prices of the firms that cannot change their prices are unexpectedly low, and demand for their output is also unexpectedly high. So we observe high output when inflation is high relative to what was expected. So, if the FOMC is a committee of Phillips curve believers, and they think that a fed funds rate in the 1.5%-1.75% range is accommodative, while a fed funds rate at 2.9% is neutral, then they must think that the average American is currently surprised that inflation is so high. As far as I can tell most people - including our central bankers - seem to be surprised that inflation is so low. So, even given the FOMC's preferred theory, their policy makes no sense. And the policy rate path they are planning is not without harmful potential consequences. The Committee actually believes that the way to bring inflation down is to produce more unemployment. What could happen is that - through Friedman's neo-Fisher effect - a higher fed funds rate produces inflation above 2%, and more unemployment to boot. But it gets even worse. Not only is the FOMC mis-applying theory, it's mis-applying bad theory. The Phillips curve does a poor job of explaining inflation, and of predicting where it's going. That knowledge has been with us for at least 40 years, with no discernible effect on what central bankers put in their models. Further, standard models that contain Phillips curve mechanisms generally give effects "precisely in the opposite direction from what the financial community and academic economists have all generally taken for granted." That is, such models typically predict that hiking interest rates makes inflation go up. This shows four conventional measures, including the inflation measure that the FOMC claims to be targeting - headline PCE inflation. All of these measures are moving up, including the most recent CPI inflation measures. I expect the next PCE inflation number to be even closer to 2%. There's nothing in the inflation data inconsistent with neo-Fisherian ideas. In particular, headline inflation has gone up since the Fed began hiking rates in late 2015. There are other factors at work of course (oil prices), but nothing that would make you think that higher interest rates cause lower inflation. If there is a sensible voice on the FOMC, it's Jim Bullard's (and that's not just me being loyal to my ex-boss). Bullard thinks that the FOMC should stick with its current policy settings. As Jim has stated publicly, those are his dots at the bottom of the chart in the FOMC projections. Jim is also well-known for dissing the Phillips curve in public. So, wise up FOMC, and listen to the guy from St. Louis.